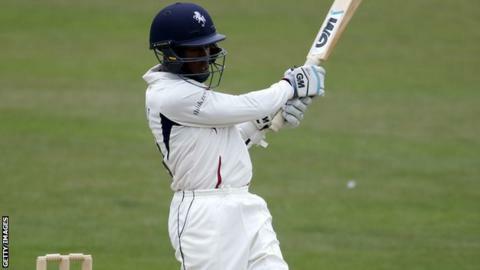 Kent batsman Daniel Bell-Drummond has signed an extended contract with his home county. Lewisham-born, Millfield-educated Bell-Drummond, who turns 22 next week, is currently one of 16 home-grown players in the Kent squad. "Daniel was on the radar of our age-group coaches from an early age," said chairman of cricket Graham Johnson. "We are confident that investing in young talent will pay dividends in the long term." Daniel Bell-Drummond hit back-to-back County Championship centuries at Canterbury in May, then made 127 against Australia in June. Added to that, his 330 runs in the T20 Blast have helped Kent earn a home tie in the quarter-finals - against Lancashire on 15 August. He added: "Sam Billings' selection for England this summer is further evidence of that. We are trying to build a squad for success in the long term and Daniel's signing shows he believes in the project." Bell-Drummond said: "It's been great to grow up with this group of lads. Team spirit is great. You can see the progress we've made, particularly in limited-overs. Championship cricket can be tough on result pitches but I'm confident there's more to come from us in the longer format."